In the new Thor movie, Thor (Chris Hemsworth) teams up with Hulk (Mark Ruffalo), Loki (Tom Hiddleston) and Valkyrie (Tessa Thompson) to fight Hela (Cate Blanchett). "I’m putting together a team," he tells Valkyrie. She says, "This team of yours, does it got a name?" Thor looks a little flustered and says, "Yeah, it’s called the Re… Revengers." When it's clear Valkyrie isn't impressed by the name he backtracks, saying, "Well, I mean, we don’t have to have a name. We could have no name." Official Synopsis: "Imprisoned, the mighty Thor finds himself in a lethal gladiatorial contest against the Hulk, his former ally. Thor must fight for survival and race against time to prevent the all-powerful Hela from destroying his home and the Asgardian civilization." 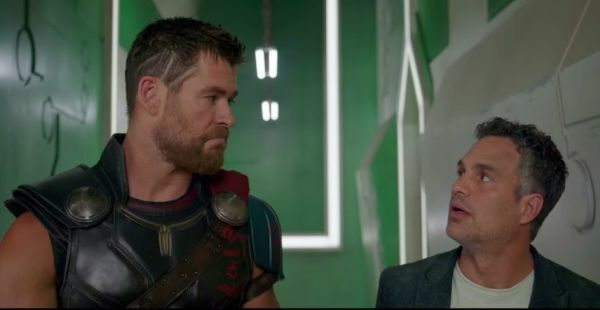 Thor: Ragnarok (2017) stars Chris Hemsworth as Thor, Tom Hiddleston as Loki, Cate Blanchett as Hela, Idris Elba as Heimdall, Jeff Goldblum as Grandmaster, Tessa Thompson as Valkyrie, Karl Urban as Skurge, Mark Ruffalo as Bruce Banner / Hulk, Anthony Hopkins as Odin, Benedict Cumberbatch as Stephen Strange / Doctor Strange, Rachel House as Topaz, Sam Neill, Ray Stevenson as Volstagg, Jaimie Alexander as Lady Sif, and Tadanobu Asano as Hogun. Thor: Ragnarok (2017) is scheduled to be released November 3, 2017, in the U.S.
For more Thor: Ragarok (2017) news, rumors, and behind-the-scenes info check back with the Geek Twins! What do you think of Thor's team name? Can you think of a better one? Caught that the other day - hilarious! Movie is going to rock. I miss his hair but it's still going to be a great movie. I can probably wait for the DVD.